When buying an apartment, it is important to understand whether the body corporate committee is professional and sensible, and whether the building owners are cohesive. An example of a building with major troubles in this area is Admiralty Towers Two at 151 Queen St. This is a prestigious riverfront building, with large apartments and great facilities, is in a really super location. However, onsite management company (that was once run by real estate agent Tavis Callard) went bankrupt a few years ago, and the receivers are trying to sell the management rights (that is, the contract for the caretaker for the building and onsite rental office). The current body corporate is opposed to management rights as a concept -- some sort of religious like zeal. 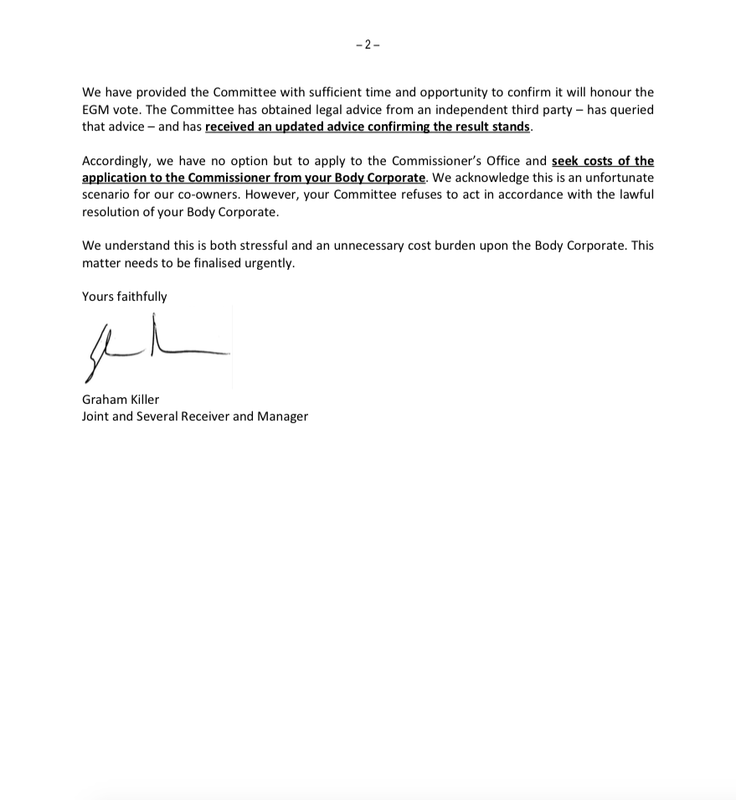 The management rights were sold, and at an AGM the owners narrowly approved the sale to the new caretaker, but the committee is trying to block the sale. 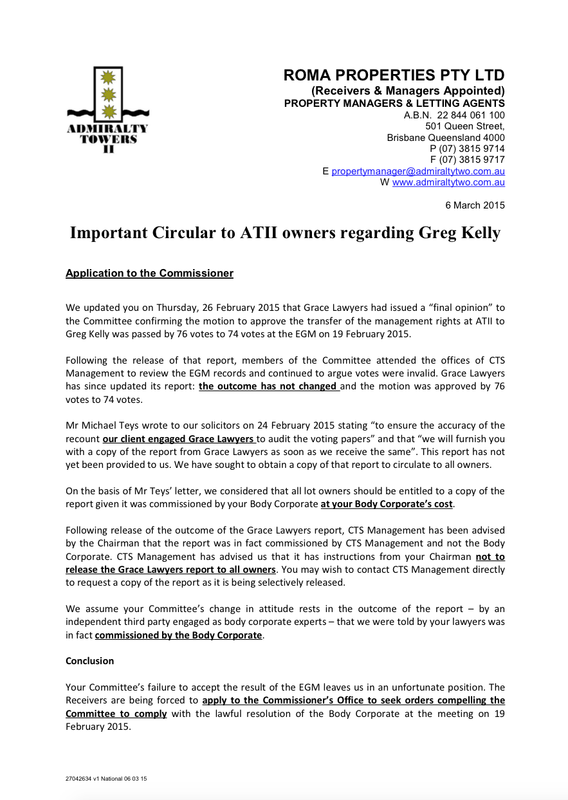 The committee is spending owners money to engage a lawyer from Sydney to fly to Brisbane on this issue -- a lawyer who has publicly stated he is against management rights. Fights and more fights. Lawyers everywhere. Uncertainty over who will be the caretaker. This has and will impact the value of apartments in this building. Another building where a fight is brewing is Quay West, where the management rights contract will come to an end in a few years. Some committee members in this building are also opposed to management rights. The committee is doing illogical things, just to make the onsite manager's life as difficult as possible. One example: the onsite manager offered to buy a new smoke detection system for the building at the manager's own cost to bring the building up to standard, but the committee rallied owners to vote against this. Does this make commercial sense? And in Admiralty Towers One, one owner keeps bring legal action against the body corporate and has been regularly unsuccessful. See this decision and this decision and this decision for example. This one owner is causing all the other owners to waste money on lawyers, rather than improving the quality of the building. Another example is The Phoenician at Broadbeach. The committee at this building has been hostile to a succession of onsite managers for years. One example -- the committee got into a trade mark litigation with the onsite manager, and lost, having to pay the legal costs of the onsite manager! What a waste of owners' money. One common threat running through all this is the Unit Owners Association of Queensland. Buildings listed above that have had internal disputes often have committee members from UOAQ living in the building or on the body corporate. It is not uncommon for committee members in such circumstances to push the views of the UOAQ with religious like zeal, often to the financial detriment of residents and lot owners.